i’ve recently been looking forward to the time when i can start sharing my love for textile crafting with M (as opposed to painting, gluing and glittering where she’s already waaay ahead of me). she’s fairly adept with a blunt needle - she can thread really tiny beads - but she’s not ready for real sewing, crochet or knitting just yet. but i hoped that perhaps weaving might be manageable at a slightly younger age. 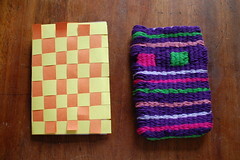 to that end i got her kids weaving by sarah swett for her birthday. to be fair i’ve seen it recommended as a great beginner’s guide for adults, with its design for a bargain loom made of plumbing pipes, so let’s call it a joint present (who was it doing all the hard work 4 years ago, eh?). i was really impressed at how quickly she picked up the first project, weaving paper strips together, i only had to show her once and she was away. as for the finished article, i’m quite impressed. i remember rigging up similar cardboard looms as a kid, but not having any guidance i had no idea how to warp them to actually produce a useable item at the end. so i’d end up with a piece of cardboard with raggedy bits of wool attached that would eventually get binned. 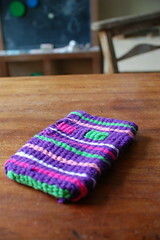 this on the other hand is a proper little baggie. not having a vast stash of wool yarn and not reading the directions to the end i used cotton yarn for the weft, not realising it was supposed to be fulled to hold it all together. as it is there are fewer holes than i expected and the only modification i would make for using cotton yarn is to knot in the ends of new threads rather than just overlapping. it’s supposed to have a drawstring that weaves through the little square sections (that have gaps between) but once it got to this stage we discovered it made a perfect sleeping bag for a gruffalo - his arms go out the side holes :D - so we never felt the need.